HOUSE OF TILES is an architectural project that is intended to showcase “Confetti”, the new collection of ceramic tiles designed by the MARCANTE -TESTA firm for Ceramica Vogue. The designers themselves, the current creative directors of the company, have come up with the idea of creating a new domestic dimension: from floors to ceilings, going through elements such as the kitchen, the bathroom cabinet up to doors, to try out unusual ways to use the ceramic product in the architectural dimension and in furnishings. A project which, shared for its styling and image/video production with the Terzo Piano firm, aims at providing new ways of communicating the ceramic product through architectural experimentation in line with the approach to the project that has always made the Ceramic Vogue brand stand out. This project is characterised by patterns of graphic inspiration evocative of a near past that can protect the most intimate aspects of people and their memories. The Confetti collection comes in one format (25x25 cm, rectified, 10 mm thickness) with four types of decorations suggested by the names of the architecture in four Italian cities: Milano, Venezia, Roma and Torino. 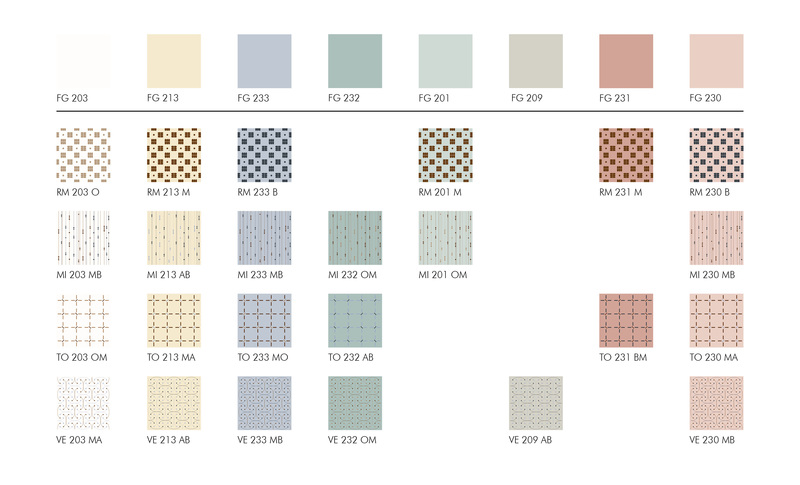 The micro patterns, available in 6 colours with an additional 8 matching solid colours, make the Confetti collection a new classic for tiling floors and walls, designed and produced in Italy coherently with the philosophy of Ceramica Vogue.